This ticket includes the following; - Seating in the Exclusive VIP Area - Padded Seats - Access to the Media Suite with the Stars We will e-mail with Hospitality Instructions & Procedures prior to the event. This ticket includes the following; - Seating in the Exclusive VIP Area - Padded Seats - Access to the Media Suite with the stars - Healthy Meal in team hospitality lounge - Soft drinks We will e-mail with Hospitality Instructions & Procedures prior to the event. Watch Battle Royale UK Football Championships 2019 at King Power Stadium in style from the comfort of an Executive VIP Box. Includes access to the Media Suite with Players. Boxes include tickets for up to & including 10 people, Padded VIP Seats, Complimentary Tea and Coffee & direct to box drinks hospitality. Hurry - Only 7 Left! Get Ready - The Ultimate Football Battle is here. Goals, Tekkerz, Megs, Tricks, we've got it all covered! Non Stop Action for everybody. 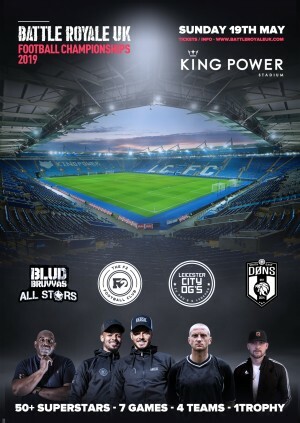 Battle Royale UK Football Championships 2019 at Leicester City FC King Power Stadium - Sunday 19th May. To ensure tickets are delivered safely and securely and to keep the price as low as possible for you, the ticket buyer, Battle Royale generally uses our E-ticket system unless otherwise stated. When you purchase tickets through Battle Royale, the full face value of the ticket is shown. This price is the price set by the event promoter and we pay this full amount to the promoter without any deductions.